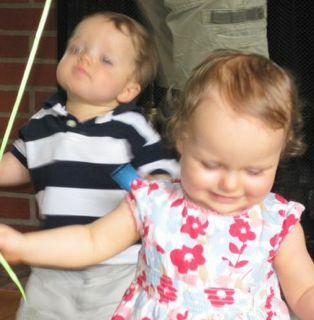 As suburban parents Thomas and Talula Vanchamps celebrate their twins’ first birthday, their joy and accomplishment is mitigated by a slight but distinct twinge of concern. While both twins, Jude and Mina, carry the angular chin and jawline of their father and the piercing eyes and cheekbones of their mother, there is one characteristic that they cannot account for and struggle to accept. To demonstrate, Thomas begins banging on the coffee table with open hands, creating a primitive, clumsy beat. Immediately, Mina begins to sway rhythmically; on every fourth beat, her shoulder bounces slightly forward; her head tilts to the left on alternate beats; her hips thrust slightly throughout the drumming, with accuracy and poise that seem to correct the awkward drumming. Jude joins in with a more aggressive, male version of her dance, using his little arms like pistons to sell his moves. At one point, Jude takes his blankie, drapes it over his shoulders and begins to leave the room exhausted – only to whip it off in a dramatic spin and dance back to center stage next to Mina. Through it all, the Vanchamps insist their love for the children has not diminished. In fact, they say they prove their love every day by patiently tolerating the gyrations, teaching them slower, stiffer ways to move and limiting their access to urban influence.